An important industrial mineral used in many chemical, ceramic, and metallurgical processes. Fluorite: This photo shows several beautiful blue cubic crystals of fluorite with occasional pyrite crystals on their faces. Fluorite is commonly found as cubic crystals, but blue crystals are unusual. 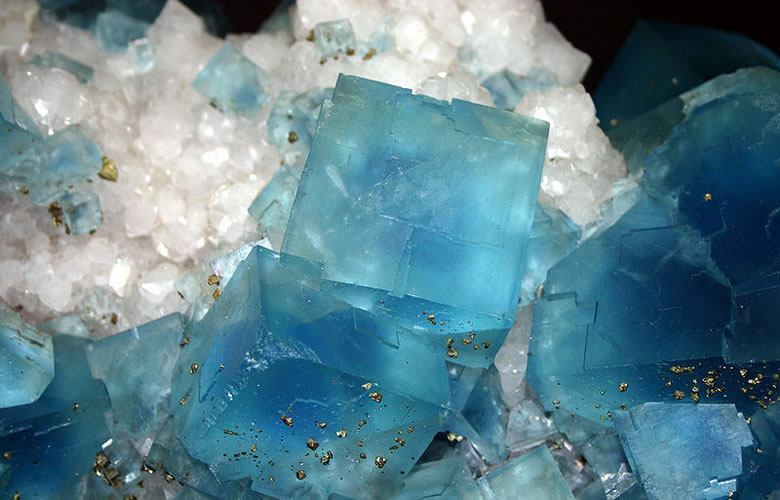 The blue color can be caused by trace amounts of yttrium substituting for calcium in the fluorite crystal structure. Photo by Giovanni Dall'Orto, used here under a Creative Commons license. Fluorite cleavage: Fluorite is the only common mineral with four directions of perfect cleavage. This perfect cleavage combined with the mineral's isometric crystal structure frequently cause it to cleave into perfect octahedrons as shown here. 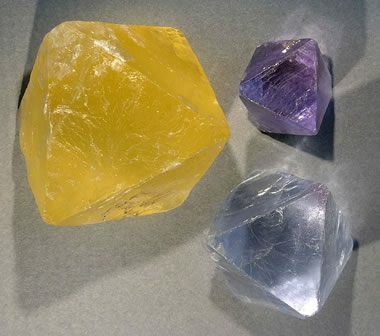 These specimens also show the purple and yellow colors that are typical of fluorite. Photo by Hannes Grobe, used here under a Creative Commons license. Fluorite is an important industrial mineral composed of calcium and fluorine (CaF2). It is used in a wide variety of chemical, metallurgical, and ceramic processes. Specimens with exceptional diaphaneity and color are cut into gems or used to make ornamental objects. Fluorite is deposited in veins by hydrothermal processes. In these rocks it often occurs as a gangue mineral associated with metallic ores. Fluorite is also found in the fractures and cavities of some limestones and dolomites. It is a very common rock-forming mineral found in many parts of the world. In the mining industry, fluorite is often called "fluorspar." Color Typically purple, green, and yellow. Also colorless, blue, red, and black. Uses Numerous uses in the metallurgical, ceramics, and chemical industries. A source of fluorine, hydrofluoric acid, metallurgical flux. High-clarity pieces are used to make lenses for microscopes, telescopes, and cameras. Fluorite is very easy to identify if you consider cleavage, hardness, and specific gravity. It is the only common mineral that has four directions of perfect cleavage, often breaking into pieces with the shape of an octahedron. 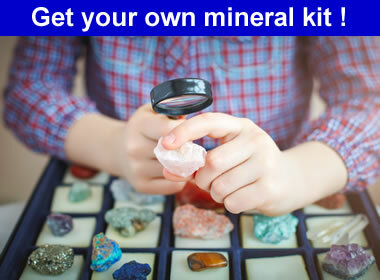 It is also the mineral used for a hardness of four in the Mohs Hardness Scale. Finally, it has a specific gravity of 3.2, which is detectably higher than most other minerals. Although color is not a reliable property for mineral identification, the characteristic purple, green, and yellow translucent-to-transparent appearance of fluorite is an immediate visual clue for the mineral. 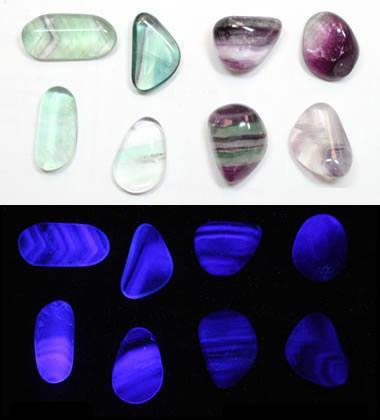 Fluorescent fluorite: Tumble-polished specimens of fluorite in normal light (top) and under short-wave ultraviolet light (bottom). The fluorescence appears to be related to the color and banding structure of the minerals in plain light. Fluorite typically glows a blue-violet color under short-wave ultraviolet and long-wave ultraviolet light. Some specimens are known to glow a cream or white color. Many specimens do not fluoresce. Fluorescence in fluorite is thought to be caused when trace amounts of yttrium, europium, samarium, or other elements substitute for calcium in the fluorite mineral structure. Fluorite crystal mass: An impressive cluster of fluorite crystals from the Berbes Mine, Ribadesella, Asturias, Spain. Specimen and photo by Arkenstone / www.iRocks.com. Most fluorite occurs as vein fillings in rocks that have been subjected to hydrothermal activity. These veins often contain metallic ores which can include sulfides of tin, silver, lead, zinc, copper, and other metals. Fluorite is also found in the fractures and vugs of some limestones and dolomites. Fluorite can be massive, granular, or euhedral as octahedral or cubic crystals. Fluorite is a common mineral in hydrothermal and carbonate rocks worldwide. 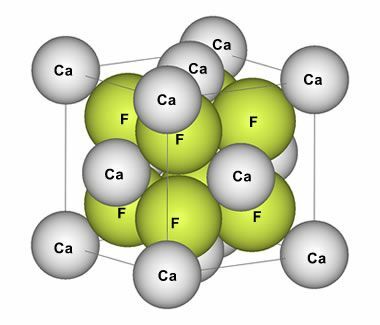 Fluorite unit cell: Illustration showing the relative size and position of fluorine and calcium ions in the isometric unit cell of fluorite. Public domain image by Benjah-bmm27. 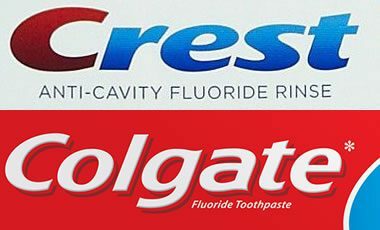 Fluoride products: Most people are familiar with fluoride products used in the prevention of tooth decay. Fluoride is added to drinking water as a systemic fluoride therapy and added to toothpastes, mouthwashes and dental rinse as a topical fluoride therapy. These uses of fluoride have been controversial. Fluorite gemstone: Fluorite can be a beautiful gemstone when faceted. It is mainly a gemstone for collectors because it has a hardness of 4 on the Mohs scale and because it cleaves easily in four directions. Fluorite has a wide variety of uses. The primary uses are in the metallurgical, ceramics, and chemical industries; however, optical, lapidary, and other uses are also important. Fluorspar, the name used for fluorite when it is sold as a bulk material or in processed form, is sold in three different grades (acid, ceramic, and metallurgical). Acid grade fluorspar is a high-purity material used by the chemical industry. It contains over 97% CaF2. Most of the fluorspar consumed in the United States is acid grade even if it is used in lower grade applications. It is used mainly in the chemical industry to manufacture hydrofluoric acid (HF). The HF is then used to manufacture a variety of products which include: fluorocarbon chemicals, foam blowing agents, refrigerants, and a variety of fluoride chemicals. Ceramic grade fluorspar contains between 85% and 96% CaF2. Much of this material is used in the manufacture of specialty glass, ceramics, and enamelware. Fluorspar is used to make glazes and surface treatments that produce hard glossy surfaces, opalescent surfaces, and a number of other appearances that make consumer glass objects more attractive or more durable. The non-stick cooking surface known as Teflon is made using fluorine derived from fluorite. Metallurgical grade fluorspar contains between 60 and 85% CaF2. Much of this material is used in the production of iron, steel, and other metals. Fluorspar can serve as a flux that removes impurities such as sulfur and phosphorous from molten metal and improves the fluidity of slag. Between 20 and 60 pounds of fluorspar is used for every ton of metal produced. In the United States many metal producers use fluorspar that exceeds metallurgical grade. Specimens of fluorite with exceptional optical clarity have been used as lenses. 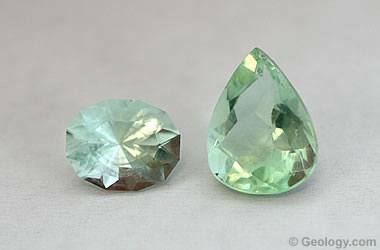 Fluorite has a very low refractive index and a very low dispersion. These two characteristics enable the lens to produce extremely sharp images. Today, instead of using natural fluorite crystals to manufacture these lenses, high-purity fluorite is melted and combined with other materials to produce synthetic "fluorite" lenses of even higher quality. These lenses are used in optical equipment such as microscopes, telescopes, and cameras. Specimens of fluorite with exceptional color and clarity are often used by lapidaries to cut gemstones and make ornamental objects. High-quality specimens of fluorite make beautiful faceted stones; however, the mineral is so soft and cleaves so easily that these stones are either sold as collector's specimens or used in jewelry that will not be subjected to impact or abrasion. Fluorite is also cut and carved into ornamental objects such as small figurines and vases. These are often treated with a coating or impregnation to enhance their stability and protect them from scratches. 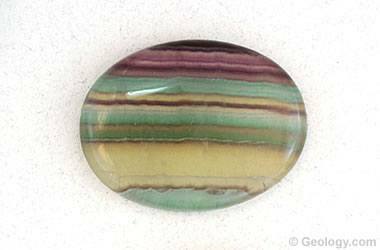 Banded fluorite cabochon: Colorful pieces of fluorite can be cut into beautiful cabochons and other ornamental objects. However, because of its low hardness and perfect cleavage, it is not suitable for many purposes. 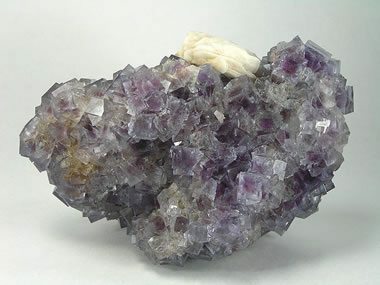 Deposits of minable fluorite exist in the United States; however, nearly all of the fluorite consumed in the United States is imported. The primary countries that supplied fluorite to the United States in 2011 were China, Mexico, Mongolia, and South Africa. All of this fluorite is imported because production costs in the United States are so high that the material can be produced in these other countries and shipped directly to customers in the United States at a lower cost. In 2011 several companies were producing and selling synthetic fluorite as a byproduct of their phosphoric acid production, petroleum processing, or uranium processing activities. A limestone producer in Illinois was also recovering and selling small amounts of fluorite from their quarry. That company is developing an underground mine to exploit a large vein of fluorite which they hope will be in production in 2013.